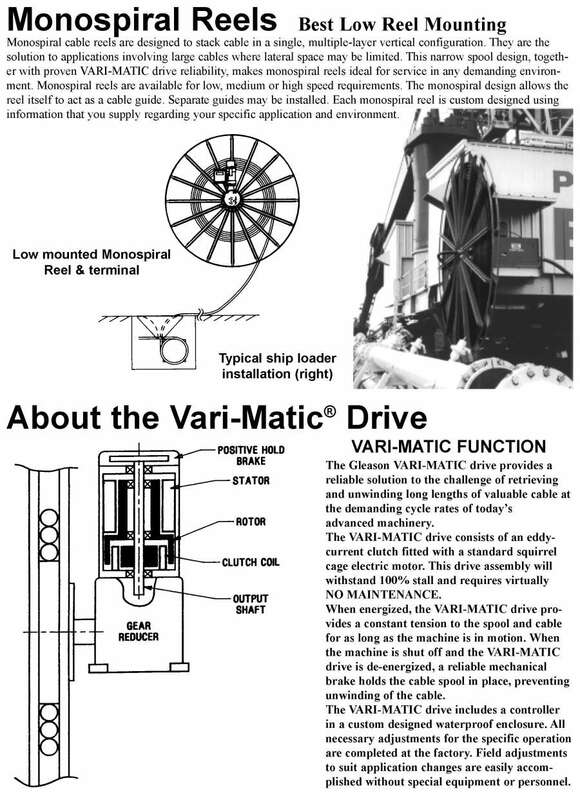 The Gleason VARI-MATIC drive provides a reliable solution to the challenge of retrieving and unwinding long lengths of valuable cable at the demanding cycle rates of today's advanced machinery. 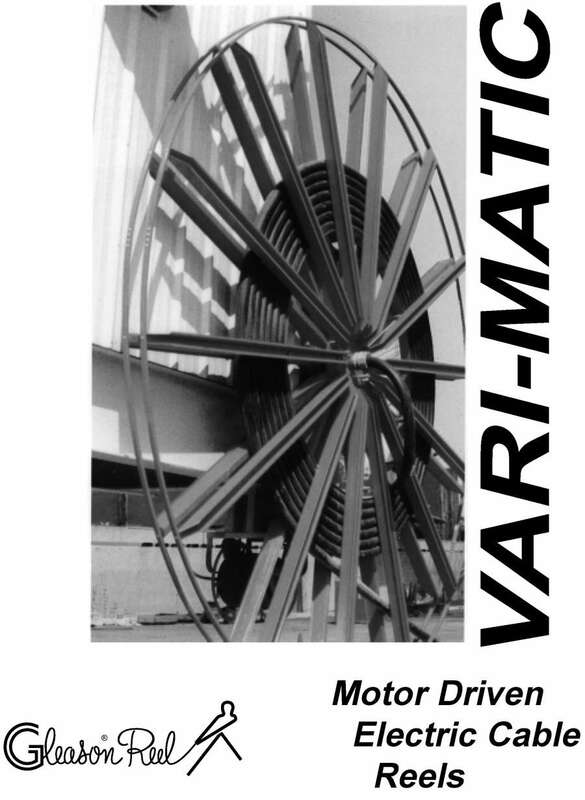 Vari-Matic Reels are available with level-wind or monospiral spools. 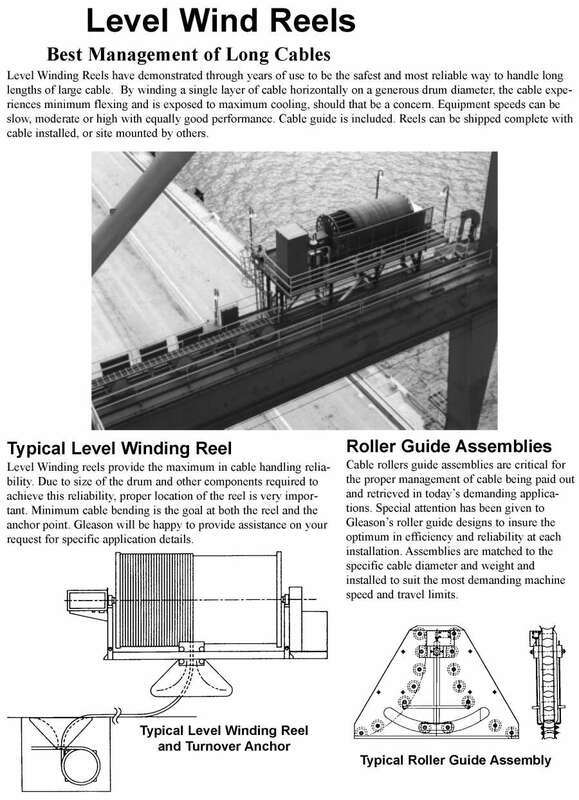 Level Wind reels provide best management of long cables and have demonstrated through years of use to be the safest and most reliable way to handle long lengths of large cable. By winding a single layer of cable horizontally on a generous drum diameter, the cable experiences minimum flexing and is exposed to maximum cooling, should that be a concern. Equipment speeds can be slow, moderate or high with equally good performance. 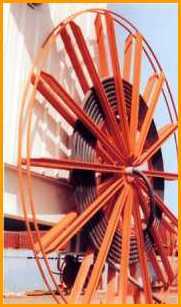 Monospiral reels provide best low reel mounting and are designed to stack cable in a single, multiple layer vertical configuration. They are the solution to applications involving large cables where lateral space may be limited. This narrow spool design, together with proven VARI-MATIC drive reliability, makes monospiral reels ideal for service in any demanding environment. Monospiral reels are available for low, medium or high speed requirements. The monospiral design allows the reel itself to act as a cable guide. Input requirements 460 Volt / 3 Ph / 60 Hz.